With the HP LaserJet Enterprise 500 MFP M525f, a small to medium-sized office can have a compact multifunctional device with direct printing capabilities. The HP M525f laser printer is reasonably fast for light to medium output, and it boasts user-friendly operation, too, but it is quite overpriced for its size and somewhat limited in its functions. Weighing almost 30Kg, the HP LaserJet Enterprise 500 MFP M525f printer is surprisingly compact for the standard office desktop. The HP 500 MFP M525f mono laser printer measures 20.3 inches wide, 22.7 inches tall, and 21.6 inches deep. The LaserJet Enterprise 500 MFP M525f multifunction printer is quite stylish and highly modern with the 8-inch colour touch screen control panel. The main connectivity options include two rear high-speed USB 2.0 ports, a high-speed USB 2.0 port for flash drives, and Ethernet. It offers fast fax transmission and the print speeds are up to 42ppm. HP mobile print is supported. Text documents are printed sharply and clearly because of the high 1200x1200 resolution. 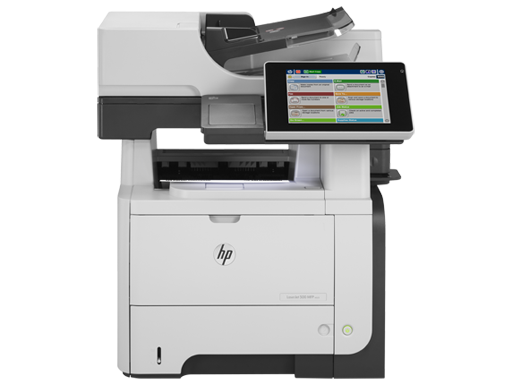 The HP LaserJet Enterprise 500 MFP M525f is easy to use because of the 8-inch touch screen. Users may add up to two 500-sheet input trays to improve the overall paper capacity. The scanner of the HP LaserJet Enterprise 500 MFP M525f includes a reversing automatic document feeder. The HP M525f high capacity toner cartridge can print approximately 12,500 pages to help lower running costs for users on a tight budget. The HP LaserJet 500 MFP M525f printer is very expensive and doesn't print in colour. Some graphics may lose some of their detail. The paper capacity of the HP 500 MFP M525f laser printer is quite poor for bulk printing, and it doesn't have an envelope feeder. Users need to have their own USB cable because the package doesn't include one. There are no further options to increase the memory.